Without boring you with all the details, here is a brief recount of our recent trip “up north”. 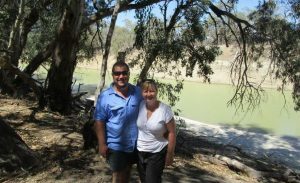 Mark and I took a week off work with the intention of meeting some friends at Innamincka. Due to some bad weather closing the roads and then a forecast of 38 degrees, we made the decision to alter our route. 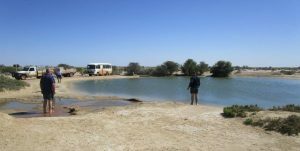 Travelling with us were my parents, in a Toyota Coaster bus, and our dog, so we were restricted where we could go. From Burra, we headed along the Eastern Road, past Red Banks Conservation Park, towards the NSW border. Popping out about 120km below Broken Hill, we drove through Kinchega National Park, to Lake Pamamaroo, near Menindee. 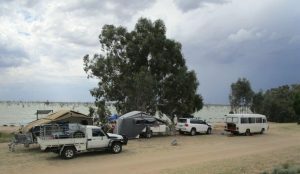 There’s not much water in Lake Menindee but Lake Pamamaroo has plenty, and this was a beautiful place to camp for a couple of days. 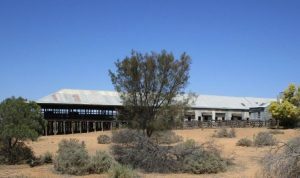 We travelled out to visit the Kinchega historic woolshed and homestead ruins, driving back to our campsite, along the Darling River. 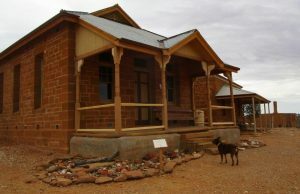 Leaving the Lakes area, we headed up to Broken Hill, towards Cameron Corner, on the border of SA, NSW and Qld. 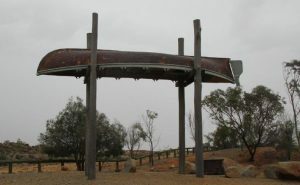 We explored the small settlement of Milparinka, with historic buildings dating back to the gold rush days, as well as Tibooburra, where a memorial to Burke and Wills is on display in the local park. After stopping at Cameron Corner, we headed toward the Strzelecki Track. It was drizzling at this time, and we wanted to get onto the track in case it closed. It was a bit slippery in places but we all got through, collecting a heap of mud on the way. 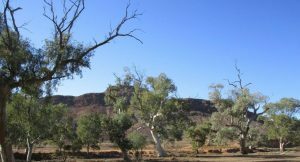 A highlight on the Strzelecki Track is the free campground at Montecollina Bore, on Lindon Station. The bore spills water into a series of dams, creating a Mecca for the bird and wildlife. It’s a lovely place to camp or stop for a while. 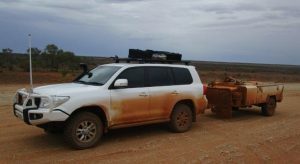 It wasn’t much further along that we left the Track and headed down to the Northern Flinders Ranges, camping overnight at Chambers Gorge, and then continuing through the Southern Flinders, towards home. So much to see…. And so little time! Guess what we’re doing when we get home!